We are particularly proud to serve thousands of satisfied users in the education sector and help to create a clean learning environment for both students and teachers. 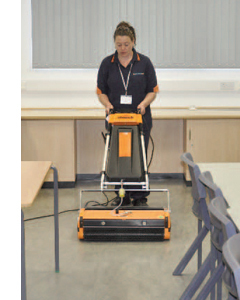 All our machines produce an effective and hygienic clean on the wide variety of surfaces found in schools such as lino, wood, concrete, anti-slip, marble, slate, quarry tiles and carpet. Rotowash floor cleaners are recommended by many flooring manufacturers for cleaning safety floors including James Halstead, Marley, Altro and Gerflor.